Vanguard released a set of all-in-one ETFs that combine globally diversified equities with global bonds. The tickers are VEQT (100% equities); VGRO (80% equities, 20% bonds); VBAL (60% equities, 40% bonds); VCNS (40% equities, 60% bonds); VCIP (20% equities, 80% bonds). The MERs aren’t officially reported yet (they need a year of history) but are projected to be around 0.24% (management fee of 0.22% plus minor other expenses). iShares also came out with comparable all-in-one ETFs XGRO (80% equities, 20% bonds) and XBAL (60% equities, 40% bonds). You’re forced to not slice-and-dice your allocation, just round off to the nearest 20%. Just one ETF to purchase, which can save commissions (if buying at a brokerage that charges commissions). All-in-one fund means that the benefits of diversification are unmissable: even if you had a hefty bond portion buffering losses in a market downturn, or were globally diversified if one equity sector was lagging, people often focus on the biggest and reddest number in their portfolio display and will still feel the stress at losses of seeing something down a lot. After all, it takes an extra conscious effort to view the portfolio as a whole. With an all-in-one fund you will only ever see the overall performance, which should work out better for many people. The automatic rebalancing/single fund does not fundamentally change the spectrum of choices: TD e-series is still “easier” despite having four components, because it doesn’t involve orders on the stock market (don’t have to worry about limit orders, rounding down number of units) and purchases can be automated. I’ve created a new figure to lay the options out (below). If you go with one of these funds, you are paying a bit more for the all-in-one nature and automatic rebalancing. Trying to tweak that by adding other funds will break those features, so you may as well add one or two more funds and just go with a typical 3 or 4 fund ETF portfolio. To be explicit, if you want a portfolio of say 70% equities, 30% bonds, buying an even split of VGRO and VBAL will get you that at the beginning, but the allocation will start to drift and you’ll have to rebalance it yourself — so you’re paying a bit more in MER for a feature that’s no longer working for you; you could instead just add one or two ETFs to build the 70/30 portfolio yourself. Similarly for adding a particular sector to tweak your allocation (whether that’s adding extra bonds, or an all-world fund if you were trying to reduce the Canadian allocation). Here’s a link to the blog post on them shortly after they were announced. In the book I briefly touch on asset location, and suggested that the point is to save tax dollars rather than tax percentages (so tax shelters may be better used for high-expected-growth equities than high-tax-rate-but-low-expected-return bonds) — but also that the complexity is likely not worth it (and I am a fan of just repeating your asset allocation across all your accounts for simplicity). I also talk about how you have to treat your RRSP as pre-tax funds. But I didn’t do a good job of explicitly linking that to asset allocation, and that factor turns out to be why others say to put bonds in your RRSP. Here’s a very long blog post with more on that. The book also introduces robo-advisors with a note of caution for non-registered accounts — the complex portfolios may be more trouble come tax time than the effort saved in automating the purchases. There were indeed a few complaints on social media from investors caught having to calculate their ACB on dozens or even hundreds of transactions, but a few firms have confirmed that they will do the work for you, including Justwealth, Nest Wealth, and Wealthsimple. This blog post has more details. You have to wait for the security to settle before it will show up as eligible for a transfer (you can’t journal DLR/DLR.U on the day you buy it). Likewise, it will take approx. a day for the move to take place to sell in the new account. For in-kind contributions, you are often restricted to contributing to the Canadian version of your account. So if you’re trying to contribute a US-listed ETF, you may have to first transfer from your USD non-registered account to your CAD registered account, wait for that to take effect, then transfer from your CAD registered account to your USD registered account. 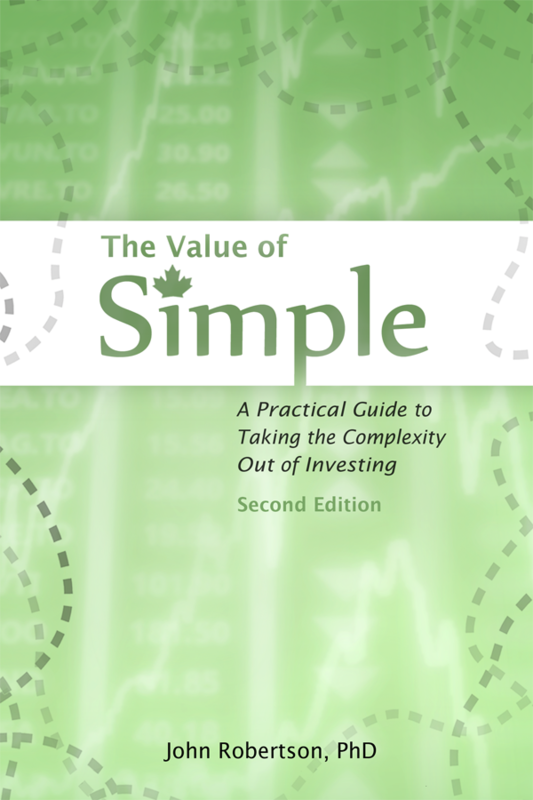 The iShares High Quality Canadian Bond Index has changed its ticker symbol from CAB to XQB (see the table on page 98 of the paperback). Also from the same table, I omitted VCN as one of the options for Canadian equities (it is closer to XIC than VCE is). As foreshadowed in the text, TD Direct Investing (Waterhouse) has implemented its switch to parallel Canadian dollar and US dollar RRSP accounts, which slightly changes the use of Norbert’s gambit for cheaply exchanging currency. Here is a PDF with a revised version of that section. Also, look below for further changes to TD’s interface. In a footnote I provided a referral code for Questrade that would provide you with free trades. Given that most readers will be using free-to-trade ETFs there anyway, their new program providing cash bonuses for signing up is likely a better deal for you. The new referral code QPass 356624159378948. The Federal government changed the TFSA contribution limits with the 2015 budget. People over the age of 18 in 2015 received $10,000 in contribution room. In 2016, the old system was put back in place, so you have $5,500 in new TFSA room for the year 2016, and this will increase with inflation in the future. Vanguard has updated some of its index funds as of June, 2015. Of note is the international fund with the ticker VDU, which will now attempt to follow an index that includes a roughly 8% weighting to Canadian equities, excluding only the US market. This is, in my opinion, not a great change for Canadian investors, as it complicates asset allocation (albeit, not in a huge way — someone with a 33% weighting to VDU would now be ~2.6% overweight to Canada). The other options for international funds mentioned in the book have not changed as of yet. Because of this, XEF should be a better choice for international funds, or the new VIU replacement fund from Vanguard. MoneySense has discontinued their directory of fee-only planners, I have created an alternative directory here. In the book I suggested that contributing to your RRSP and deferring the deduction may be a good move if you were expecting to be in a higher tax bracket in the future. See this post for why that’s rarely actually good advice — if you’ve filled your TFSA room, you will likely prefer to either use your RRSP and take the deduction right away, or invest in a non-registered account until you’re actually in that higher tax bracket. After publication, a new type of service started emerging: robo-advisors. These firms will help automate a broadly diversified investment strategy at a reasonable cost, usually less than what Tangerine charges, but typically higher than TD e-series. Though they are new, they may be a good option for some people. There are a lot of new firms in this area though, and they all have different pricing models, so it’s hard to say which will be best for you. I helped create a comparison tool to help you calculate which would be the cheapest for your situation, and to filter by various criteria. You may also enjoy this episode of Because Money on robo-advisors and the comparison tool, as well as this one on how they’re not quite perfect. At the end of 2015, Questrade updated their interface. This major change now means that your statements and trading platform are in one place. I’ve updated the section of the book with the new step-by-step instructions — click here to download a PDF of that section. For March 2016, the account fees at TD Direct Investing are changing. Rather than free non-registered and TFSA accounts, and a $25/yr charge for RRSP accounts under a certain size, the new account fee is $25/qtr ($100/yr) when all of your household accounts have less than $15,000 in them combined, and no fees when your household has more than $15,000 at TDDI. Moreover, these fees are waived if you have a systematic investment plan of $100/mo or more (i.e., if you’re automatically purchasing e-series funds every month). This is an improvement for people with small RRSPs looking to use e-series, and lets you use your spouse’s or parents’ account to get over the limit more quickly (if you live together), though for those who were starting out with smaller amounts in TFSAs this will force the use of automation. It also does away with the previous fee on RESP accounts that was unavoidable. Though the annual amount is higher, this new fee structure (with the easy way to avoid it entirely) should make TDDI an even more attractive choice over TDMF for e-series. I have also updated the section of the book on TD for the new interface (click here). Some users have reported difficulty viewing the images in the Kindle version when using Amazon’s software readers (i.e., purchasing from Amazon to read on an iPhone or PC instead of on a Kindle device), and that the Kindle software is not enlarging the images. Here is a PDF of the figures and tables from the book that should help. Some images require context and can’t be posted separately.